Millennials are continuous learners, team players, collaborators, achievement-oriented, socially conscious, and highly educated. Like many of us, they hate to have their time wasted in meetings that become soul-sucking chores. The experience of a meeting has a ripple effect that reaches far beyond those in attendance. If the outcome is enthusiasm, that enthusiasm spreads. If the outcome is cynicism, that cynicism spreads. Can you afford to have meetings where disengagement is the primary outcome? Where the newest members of your workforce leave disenchanted and disengaged? In a recent Forbes article, Ron Ashkenas talks about the importance of “creating an environment in which the new guard [Millennials] will thrive, with more flexibility, transparency, engagement, and fun,” and how such an environment is necessary for the ultimate success of the organization. Why focus on meetings when it comes to Millennials? Because meetings are a snapshot of your organization’s culture. Each meeting is a picture in time of decision-making, authority, and communication patterns; the way people relate to each other. What happens in meetings says more about what is really important in your organization than any statement of company values. It is in meetings where Millennials learn what is really important in your organization. As a leader, you have a great deal to say about the meetings you conduct in your organization. 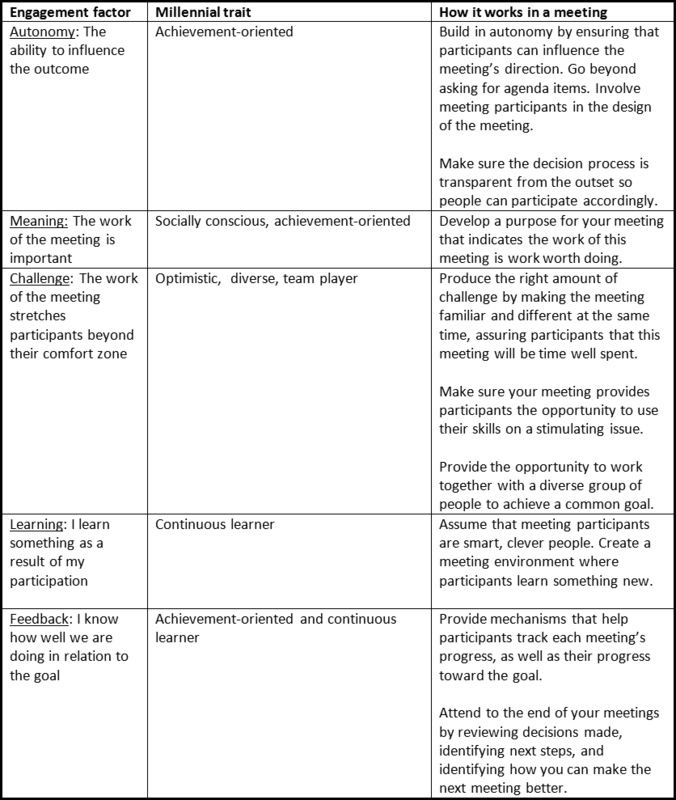 What if you designed and conducted meetings in ways that engaged rather than disengaged participants? Everyone would benefit, no matter the generation. Engaging meetings carry the electric charge of autonomy, meaning, challenge, learning, and feedback. These are the critical factors when it comes to whether you engage or disengage from a task. While it is true that autonomy, meaning, challenge, learning, and feedback are important to everyone, they are especially important to Millennials. The following chart shows how these core engagement factors relate to Millennial traits, and how to create meetings where people leave with a real desire to make something happen. Do your meetings ignite action? Do they spur commitment? Does real work happen? If not, then instead of getting mad at meetings, make sure your meetings carry the electric spark that comes when your meeting rests on a foundation of autonomy, meaning, challenge, learning, and feedback. If you do, everyone will benefit. Posted in Meeting Strategies, Millennials.